Riverside Cottage, in Bransbury near Barton Stacy, was purchased over 10 years ago as a family home – “it was wonderful to see the children open the car doors and run enjoying their surrounding as soon as we arrived after a journey from London”. But understanding that it was a bit of a luxury to have an empty home while working back in London they decided to let it out. “It was a house that needed to be full of people and laughter. It’s a house that lends itself to entertaining”, says Clare who now spends much of her time back and forth from city to country to tend to her business. So what exactly does Riverside Lifestyle comprise of? the lodge in the grounds sleeps 4. It’s certainly far from the madding crowd, but just the right distance from London for people to find with ease and to escape to. 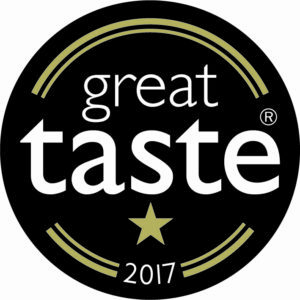 Riverside is also gaining ground for their natural olive oil and sea salt crisps – these are one of the sponsors of the Winchester Wine Festival. 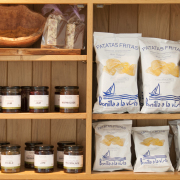 Each of these products have been praised by the guests encouraging Clare to invite farm shops and delis, and even larger retailers to stock Riverside products – locally shops such as Weyhill Farm and Sparsholt Village Shop, and further afield farm shops such as The Hungry Guest in Petworth and Cowdray in Midhurst. In fact Riverside products are now stocked in 35 stockists from Torquay to Newcastle. Riverside is also linked to Cassandra Cup Bistro in Chawton and opposite Jane Austin’s house where their raspberry and lavender jam has proved to be hugely popular and is part of their successful cream teas. Riverside are members of Hampshire Fare and Clare is keen to use this to further the local networking. 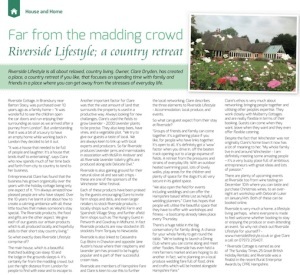 Clare describes the three elements to Riverside Lifestyle – Accommodation, local produce, and events. So what can guest expect from their stay at Riverside? “Groups of friends and family can come together, it’s a gathering place if you like, for people who have links together. It’s open to all. It’s definitely got a ‘wow’ factor when you drive in, off the beaten track opening out to a large expanse of fields. A retreat from the pressures and strains of everyday life. With an outdoor heated swimming pool, lots of lovely walks, play areas for the children and plenty of space for the dogs it’s all very secure in its gated space. “We also open the field for events including weddings and can offer the Hampshire based White List as helpful wedding planners.” Clare has hopes that people will utilise the beautiful space that they have to offer with workshops and fitness – a bootcamp already takes place every Thursday. Clare’s ethos is very much about networking, bringing people together and utilising other peoples expertise. 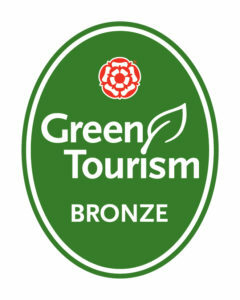 They work closely with Mulberry Cottages and are really flexible in terms of their booking. Guests can come when they want, leave when they want and they even offer flexible catering. There are plenty of upcoming events at Riverside too from wine tasting on December 10th where you can taste and purchase Christmas wines, to an over- night art workshop with Deborah Luker on January14th. Both of these can be booked online. Riverside is very much a home, a lifestyle living perhaps, where everyone is made to feel welcome whether booking to stay or enjoying the produce or even attending an event. So why not check out Riverside Lifestyle for yourself? – www.riversidelifestyle.co.uk or give Clare a call on 07973 215407. * Riverside Cottage is named as one of The Sunday Times 25 Great British Holiday Rentals; and Riverside was a finalist in the recent Rural Enterprise Awards by CPRE Hampshire.